I recently got some tools for working with Encaustic Wax and I am providing this Encaustic Wax Tutorial and a review of the products I used. 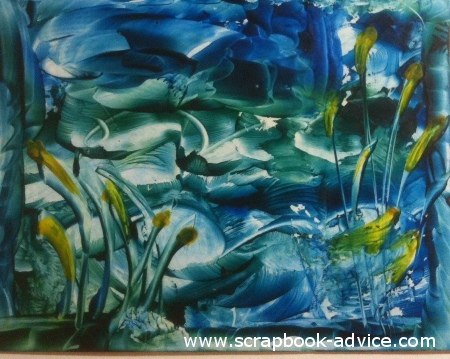 What is Encaustic Wax painting? 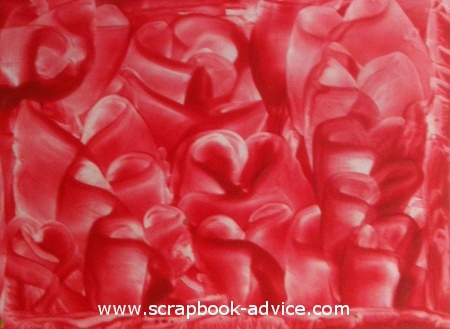 First of all, what is Encaustic painting or Hot Wax Painting? 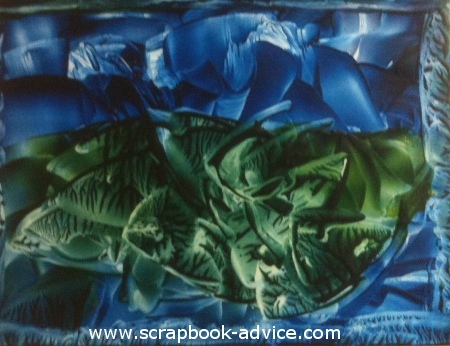 Well the word Encaustic means to "burn in" from the Greeks and this is done by applying hot pigmented wax. Hot wax painting was originally developed by the Greeks as they used hot melted wax to fill in the cracks of their ships. Color or pigment was added later and then used to paint pictures. 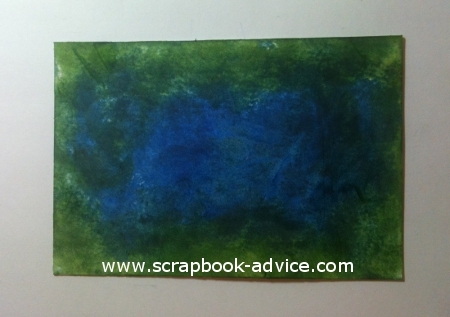 I have recently been seeing Card makers use the Encaustic Painting as backgrounds for their cards and thought I would give it a try myself. 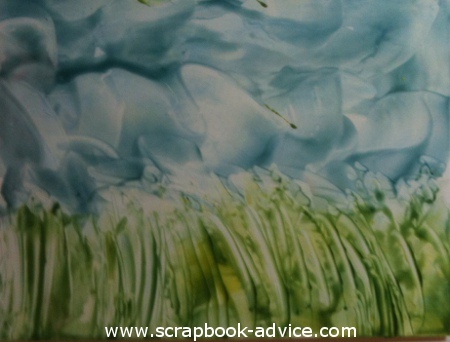 This Encaustic Wax Tutorial is the result my research and practice. The tools I used for this process were all from Purple Cows and included the Melt Dual Temperature Craft Iron with 6 Tips #5050. , the Encaustic Wax Kit #5060 with 3 tips, clear wax and some sand paper for tool cleaning and Encaustic Wax Color Sets-Primary #5062 with Red, Blue and Yellow wax. These are great products so if you are just getting started and want to give the Encaustic Wax techniques a try, check out the Purple Cows site. Purple Cows also offers a metallic set of Encaustic Wax which will have to be my next purchase. I had a conversation with the Creative Director of Purple Cows last week and she told me that it was addictive. Well, that was certainly true! I didn't stop playing until I was out of card stock to use. The items below are what I cam up with. Not particularly artistic, but certainly fun. I currently can't link directly to Purple Cows website, but the phone number for them is 877-386-8264. *A Craft Iron specifically to melt the wax - Travel Iron size but with no steam holes. I found this particularly useful as I started mixing my colors to make other colors and used the craft sheet like a pallet. I also put a pad of paper underneath to protect my desk top. 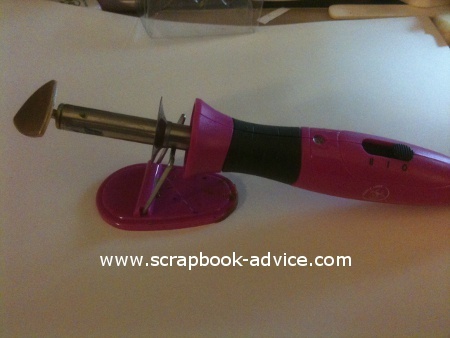 This is the Craft Iron I used from Purple Cows with the comfort grip, medium-low-off temperature switch, and tip rest. These are the extra tips that came with the Melt Craft Iron. Aside from the mini-iron, there is a small wire brush, a chisel for doing calligraphy style work, a taper for intricate details, a wax pen and a mini-flow for small dots and circles. 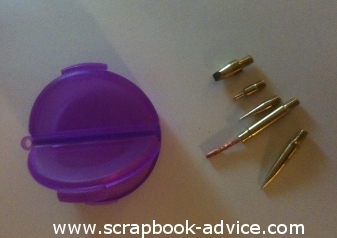 Also included is the little tip storage container - very handy! These are the items that come with the clear wax package. An Extra Iron tip, brush tip, wax pen and a little sandpaper for cleaning off the leftover wax. Step 1. Lay out your work area. Remember you will be working with hot colored wax. You will need to cover your table top with a magazine or pad of paper to protect against both the heat and the color from the wax. If you have a Craft Sheet, that goes next, then some type of scratch paper - I used old phone book pages to catch the excess melted wax. Then your paper or card stock that you will be painting on. Use a glossy finish card stock for your first tries on this. I have attached some great videos by John Vandebrooke put together for Expert Village which are wonderful and will help you learn this old/new art form of hot wax painting. Step 2. Have your tissue handy, your wax blocks on the right if you are right handed and your Craft Iron heated up and also on the right side. If you are a lefty, it will be easier to put the wax and craft iron on the left side. Step 3. When your Craft Iron has heated up, carefully rub one of the colors of wax onto the flat surface of the Iron. The wax may drip off some (thus the scratch paper). Step 4. Holding the Craft Iron horizontal with the card stock, lightly drag the Craft Iron across the surface of the card stock. You are not ironing wrinkles out of clothes, but layering hot wax. The wax will slide off onto the paper as you move the iron and the designs will vary according to how you move the iron. Step 5. When using the small size Craft Iron, like the one I got from Purple Cows, you will need to reload your iron with more wax to cover the card front. 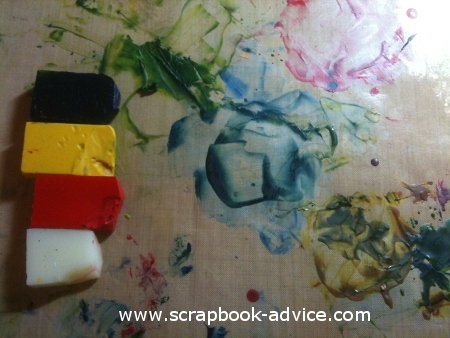 I found it helpful to melt a little puddle of wax - 3 to 5 drops - onto the Craft Sheet like paint onto an artists pallet. That made loading the Craft Iron a little easier and faster. Also a great way to mix colors which I had to do since I only had blue, red and yellow, plus clear. Once I mixed the wax, I could be sure that each trip back for more wax would be the same color. 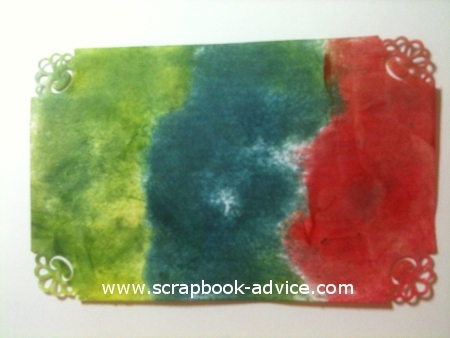 Here's a photo of where I mixed the wax colors on my Craft Sheet. Take a look at this Encaustic Wax Tutorial video to see how this Craft Iron can be changed out and also to see the great selection of waxes. I enjoyed this experiment so much, I can't wait to get more colors than just the three colors I started out with. All the previous images you have seen here have been done on Glossy Paper. I used Ranger Inkssentials. For these images, I used regular matte scrapbook paper. 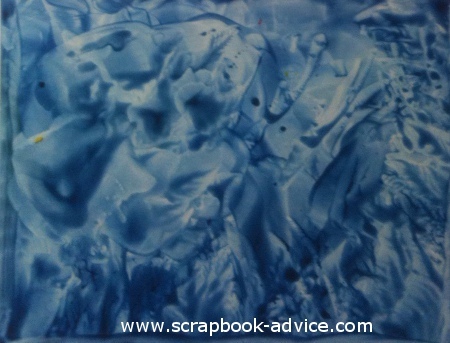 I found that the wax was absorbed into the paper and did not give the wonderful marbling that the Glossy Paper did. Certainly not the exciting marbling look, but I like this as well and think it looks a little like Batik. 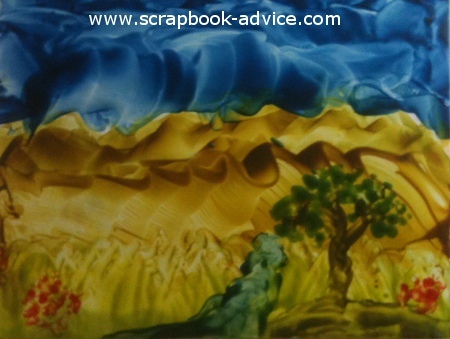 Check out the Encaustic Wax Tutorial video for some more interesting ideas on your hot wax painting. 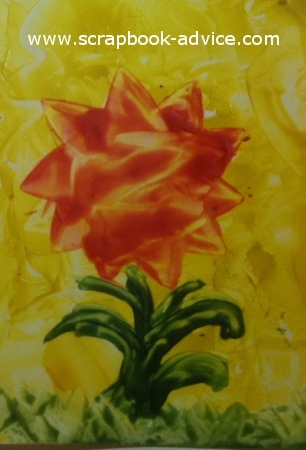 Using Clear Wax to Soften Encaustic Wax Colors. 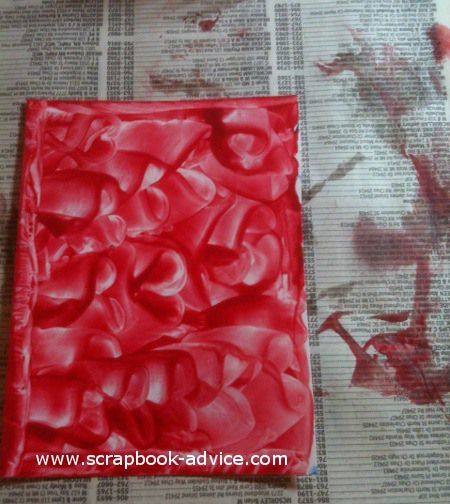 Step 6 of the Encaustic Wax Tutorial. 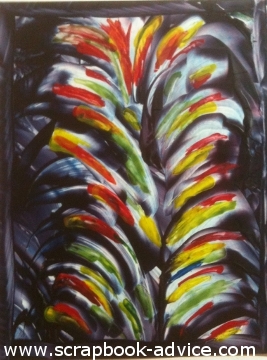 As I only had the 3 Primary Colors of Blue, Red and Yellow, I was experimenting with mixing colors. 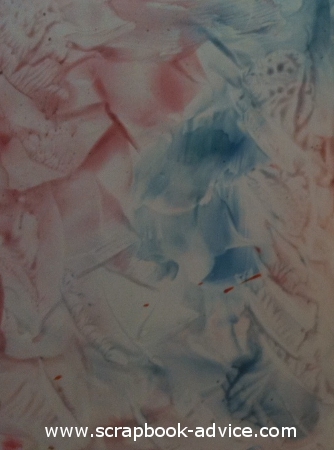 Then I decided to mix the red and blue on the Craft Sheet with a lot of the Clear Wax. This was the result below and I just love the pastel pinks and blues. This art form, at least at the beginning stages, certainly seems to be quite forgiving. 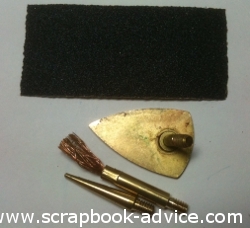 It allows for you to make changes just by moving the iron over the wax to remelt it, and moving it off the page. 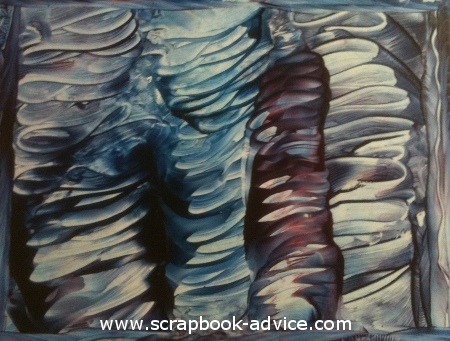 Check out this Encaustic Wax Tutorial video to see what changes occur right before your eyes. You can make your own, but I am planning to get some of Mr. Vandebrooke's amazing colors from his website. After watching John Vandebrooke's video on Landscapes, this was my poor attempt. But I think I figured it out and would be able to do a lot better with more practice and if I had the larger Craft Iron. I have seen Encaustic Wax paintings that had other things embedded into the picture. For instance, a real leaf could be placed between layers of the wax, photographs, charms, laces, or I guess just about anything flat enough to be covered by the wax. 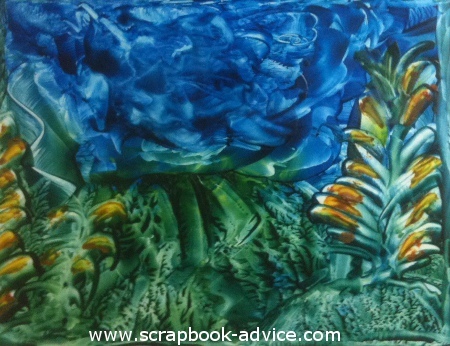 Here's an Encaustic Wax Tutorial video that will give you some more ideas. Step 6. After finishing up your little painting, it needs to be polished with a facial tissue and coated with a wax sealer. Here I tried to mix the Blue and Red Wax to come up with a Purple. It looks much better in real life than in this photo and it beautiful. This little card was an attempt to use all the colors I had and could mix. 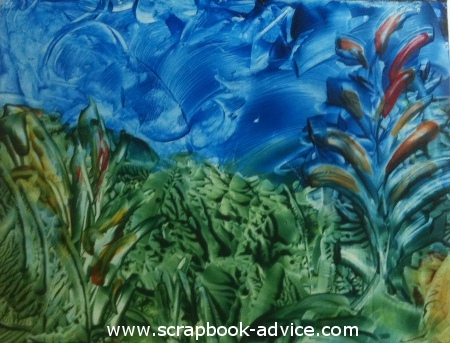 I hope you have enjoyed this Encaustic Wax Tutorial and the great videos from John Vandebrooke. This did turn out to be addictive, very easy and interesting, and I loved the great tools and wax provided by Purple Cows.